This month we’d like to help you play like a rock-n-roll guru! 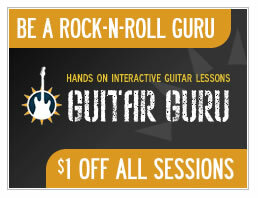 We’ve taken off $1.00 on every Guitar Guru Session in our catalog, offering you the chance to learn your favorite songs! Choose from blues Sessions like The Thrill is Gone or classic rock Sessions like Barracuda. No coupon code is required for you to enjoy this limited time offer, which is good through the entire month of May. Want more Guru? Each week we’ll be getting behind-the-music to feature some of your favorite artists and performers that define what a “rock-n-roll” guru is all about. For more about how this software can help you learn your favorite song, visit Guitar Guru Sessions online or download your free Guitar Guru Session on our free sheet music page and give Guru a try! Download Old McDonald Had a Farm for Free! Did you know that “Old McDonald Had a Farm” has a song history spanning over two hundred years? Some music scholars speculate that the song’s history may be traced to an early 18th century opera called “The Kingdom of the Birds,” but it wasn’t until the early 20th century that “Old McDonald” evolved to the song as we know it today. Initially published in 1917, this beloved nursery rhyme has been translated into several languages and has been recorded by dozens of performers around the world. Download free sheet music for Old McDonald Had a Farm through the end of May. Don’t forget, this song is eligible for your entry into our Musicnotes.com YouPerform Contest for May 2009. Just join our May 2009 contest group on YouTube! and submit your performance for a chance to win! Vote Now for Your April 2009 Contest Winner! Speaking of contests, will you help us decide your favorite YouPerform contest winner for April? We have three entries this month, and we’d love to get your vote. Hope you’re considering entering next month’s contest, we’d love to hear you sing or play! Don’t forget to check out our Musicnotes.com YouPerform Contest rules page to find out how you can submit your video for May! Ref $1 off, excellent time to use One’s gift certificate/card. For performer C I accidently clicked 1 star because I thought that where the five star button was!